Our Daily Package is aimed at Tourists and expats who do not have their own tackle or have limited experience in methods and baits used to catch the species stocked in Go Bee Fishing Park. 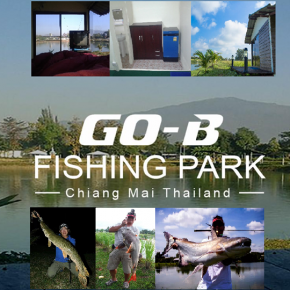 Go Bee Fishing Park is about 20 mins drive from Chiang Mai town Center. We will pick you up around 9:00am and drop you back around 10:30pm so you can enjoy a full days fishing. Prices quoted are per angler and are fully inclusive of transfer to and from your Hotel, full day package also includes tackle, bait (bread 3 kg.+Chicken coil 2 pack), and lunch authentic Thai cuisine. Guide fishing service for 5 hour. Non-fishers are welcome and they will only be charged a small supplement only if they are joining you to eat in our restaurant. Our Bar/Restaurant can supply any drinks or snacks they may need. Paying Fisherman only has to pay for drinks if they are alcoholic. Our fully stocked bar can provide a refreshing ice-cold beer at any time. So if you want to celebrate a catch, enjoy a sundowner with your non-fishing friends and sip a cocktail as the sunsets across the lake. Or perhaps relive the days action with other fisherman at the bar at the end your session, our waterside Restaurant and Bar makes all this possible. Our waterside restaurant is suitable to fishing asmosphere, so you have the choice for eating and fishing there or we can serve your meals bank side on one of our shady tables. So no matter where you choose to eat, you will still be next to your rods while you are eating and no valuable fishing time will be wasted. Children are welcome and we are happy to instruct them, for the very young ones just starting out we have light tackle fishing, which usually produces non stop action, All of the prime species must be returned alive and unharmed. Go Bee Fishing Park is in a beautiful location, surrounded by rice fields, there are many attractions near by for the non fisherman (wives, friends, Children), we have our own crocodile pit, Children’s play area and ATV's which are available for hire to be driven off road on our land and some trails close to the lake. Also within 5 - 10 mins drive there is the Night Safari, also Royal Flora Ratchaphruek botanical gardens, plus there are numerous Temples and Wiang Kum Kam, The Ancient Lost City is nearby, we are happy to arrange a time table for non fisherman to have a full day of fun close enough to you that they can return to eat with you at meal times.